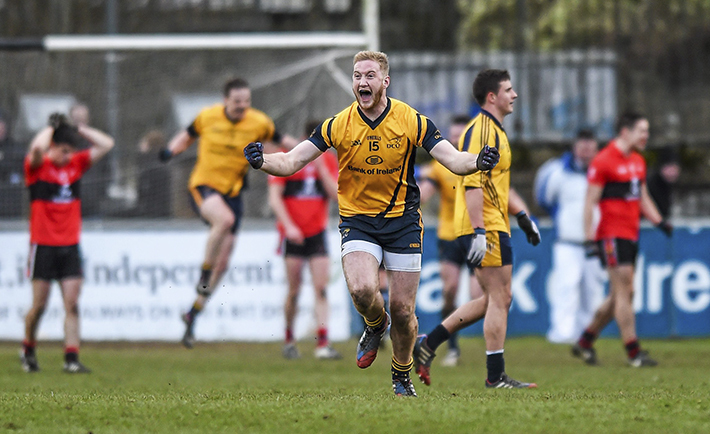 Extra time was needed to separate the sides as DCU came from behind to grab their third Sigerson Cup in six years. Conor McGraynor scored a crucial late point with a minute to go before UCC missed the chance to equalise in the dying moments which gave the Dubliners the cup. It was the home side that scored first from a free by Conor Cox after Brian O’Driscoll was fouled. DCU got their reward for their early pressure as star man Enda Smith put Donal Wrynn through on goal but the Leitrim man sliced over the bar. DCU then took the lead through the boot of Dublin man Conor McHugh who floated over a point after being fouled by the UCC defence. The teams traded points all afternoon and there was little to separate the sides in the opening quarter. The pick of the scores coming from Thomas Clancy who levelled it up with a long range effort after ten minutes of play. Shaun Keane put the Cork men in front before being pegged back by another McHugh free. UCC were having the lion’s share of possession with 61 percent after 15 minutes but were failing to take advantage. Meanwhile DCU’s Smith and McHugh were linking up well but were so far being kept quiet by the UCC defence. The teams continued to stay in touch with each other until UCC had a goal disallowed on 25 minutes with Sean Kiely judged to have fouled DCU keeper Tadgh Lowe. It proved to be a spark that the game needed as both teams pushed on. Kerry’s All Ireland winning forward Paul Geaney put one over to put his side two points ahead on 27 minutes. DCU then got themselves back into the game with points from Smith and Eoin O’Connor right before the break to put the teams level going in for half time. DCU boss Niall Moyna decided to make a few changes at half time bringing on Donie Smith and Mickey Quinn for Connor McHugh and Dessie Ward respectively. DCU took the lead as the second half kicked off with Enda Smith still driving his side on scoring a fine point from open play. UCC replied with 37 minutes gone through sub Alan O’Donovan. The game was crying out for a goal and it finally came with 10 minutes gone in the second half. Donie Smith swung in a cross and Donal Wrynn was on hand to tap in from close range. After 40 minutes, it was DCU up by that goal 1-06 to six points. UCC had their own goal chance five minutes later but a brilliant save by keeper Lowe denied David Harrington but the resulting 45 was scored to cut the lead to two. Conor Boyle looked to have won it for DCU with a point to stretch the lead before a great cross-field kick put O’Donovan one-on-one with the keeper and he punched to the net to put UCC a solitary point ahead with one with a minute to go. Credit to DCU though, they never gave up and a late free was slotted over by keeper Lowe to bring the game to extra time. The additional 20 minutes saw DCU boosted by their heroics and they lead by two at the end of the first period. A brilliant goal from David Culhane put UCC up by one at the start of the second half but points from Donie Smith, Conor Daly and the winner by McGraynor saw the cup return to North Dublin. DCU: Tadgh Lowe, Jack Smith, Conor Boyle, Conor Daly, Conor Moynagh, Dessie Ward, Colm Begley, Eoin O’Connor, Stephen O’Brien, Diarmaud O’Connor, Conor Meredith, Donal Wrynn, Enda Smith, Conor McGraynor, Conor McHugh. Scorers: Donal Wrynn: 1-1, Enda Smith: 0-3, Conor McHugh: 0-2, Eoin O’Connor: 0-2, Tadgh Lowe: 0-2, Donie Smith: 0-1, Conor Boyle: 0-1, Conor Daly: 0-1, Stephen Boyle 0-1. UCC: Michael Martin, Fergal McNamara, Jack McGuire, Padraig O’Connor, Conor Dorman, David Culhane, Thomas Clancy, Gary O’Sullivan, Sean Kiely, Shaun Keane, Luke Connolly, Brian O’Driscoll, Paul Geaney, David Harrington, Conor Cox. Scorers: Alan O’Donovan 1-1, David Culhane: 1-0, Conor Cox 0-3, Thomas Clancy: 0-2, Luke Connolly: 0-1, Gary O’Sullivan: 0-1, Kevin Davis: 0-1, Shaun Keane: 0-1.